Acantholytic acanthoma is an asymptomatic keratotic papule or nodule that clinically documents a tendency for older patients, truncal involvement and a predilection for men, while histologically; it manifests a wide acantholytic spectrum. We describe a case in a 59-year-old male who presented with a single hyperkeratotic nodule on his face, of four-month duration. Histopathological examination revealed extensive acantholysis involving multiple levels of the epidermis. In absence of other acantholytic disorders or other similar lesions elsewhere, the diagnosis was confirmed as acantholytic acanthoma. Acanthoma is a generic name for a group of benign tumors of epidermal keratinocytes, with their unifying characteristics that include: a benign behavior, epidermal hyperplasia, and lack of dysplasia, that is to say neither that, solar keratosis nor Bowen's disease would be considered as members of this group . In 1988, Brownstein described a previously unrecognized benign cutaneous neoplasm to which he proposed the name acantholytic acanthoma . Typically, it is an asymptomatic keratotic papule or nodule; it clinically documents a tendency for older patients, truncal involvement and a predilection for men; while histologically; it manifests a wide acantholytic spectrum [ 3, 4, 5 ]. Multiple lesions were described in the immunosuppressed patients. A 59-year-old male presented with a single nodule on the face below the left eye that appeared about 4 months prior to his presentation, as a small keratotic papule gradually growing to reach its current size of about 2X3 cm. The nodule was erythematous, with a rough surface, but apart from its unsightly appearance, it was asymptomatic. 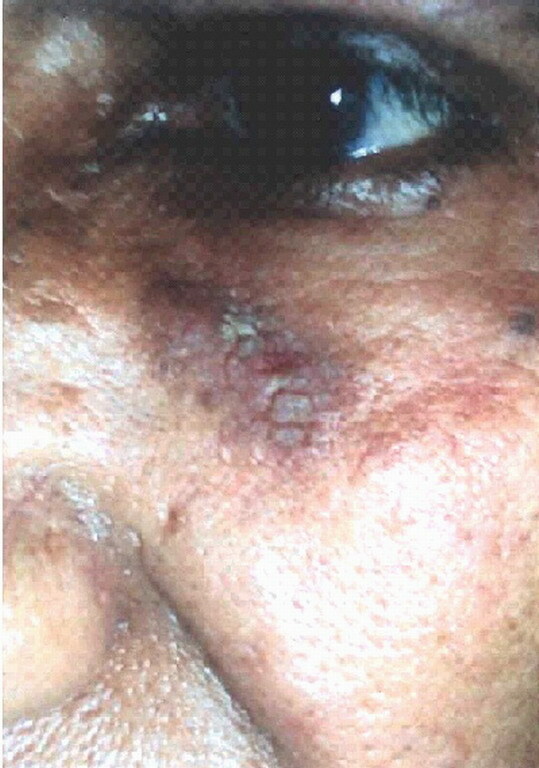 Differential diagnosis included solar keratosis, Bowen's disease, seborrheic keratosis, and superficial basal cell carcinoma. 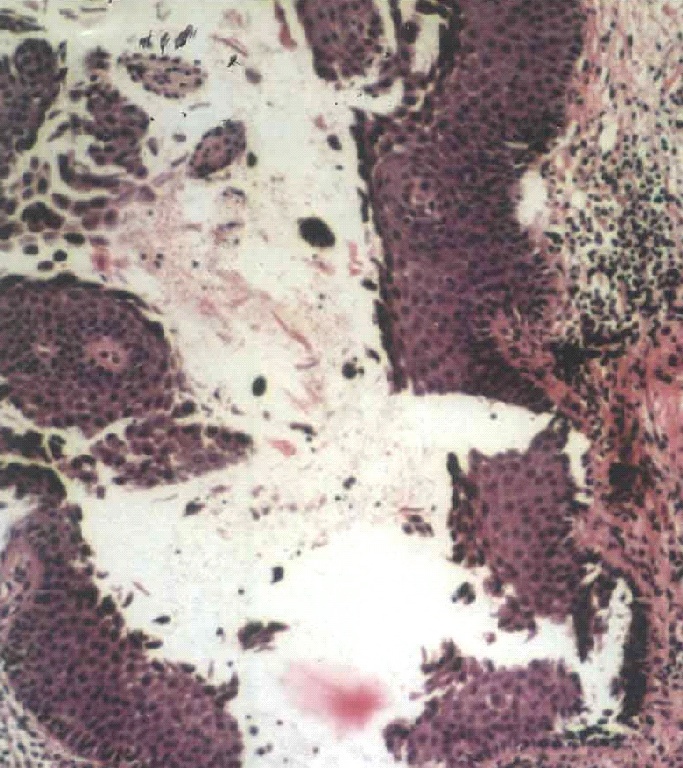 Histopathological examination revealed epidermal hyperplasia. On higher power, acantholysis; which involve multiple levels of the epidermis. It extends superficially throughout the Malpighian layer and suprabasally forming clefts and leaving one row of cells at the floor of the blister. The dermis showed a mild infiltrate. Asymptomatic erythematous nodule with rough surface. which involve multiple levels of the epidermis and mild dermal infiltrate. In addition to acanthosis, each one of the acanthomas has its own prominent distinguishing histopathologic pattern of aberrant keratinization as epidermoid keratinization in seborrheic keratosis, absence of keratinization in clear cell acanthoma, epidermolytic hyperkeratosis in epidermolytic acanthoma, dyskeratosis in warty dyskeratoma, etc. . Of those, acantholysis is the hallmark of acantholytic acanthoma . With such a prominent acantholysis in a solitary lesion, and since the patient had no evidence of either superficial or deep pemphigus, Hailey-Hailey disease, Grover's disease, or even any other similar lesion elsewhere, the diagnosis of his condition had to be acantholytic acanthoma. Therefore, acantholytic acanthoma must be kept in mind should we become confronted with a solitary keratotic papule or nodule, with prominent acantholysis as its main pathologic feature. 1. Brownstein MH: The benign acanthomas. J Cut Pathol 1985; 12: 172-88. 2. Brownstein MH: Acantholytic acanthoma. J Am Acad Dermatol 1988; 19: 783-6. 3. Megahed M, Scharffetter-Kochanek K: Acantholytic acanthoma. Am J Dermatopathol 1993; 15: 283-5. 4. Barnette DJ Jr, Cobb M: A solitary erythematous hyperkeratotic papule. Acantholytic acanthoma. Arch Dermatol 1995; 131: 211-2, 214-5. 5. Kim SH, Choi JH, Sung KJ, Moon KC, Koh JK: Acantholytic acanthoma. J Dermatol 2000; 27: 127-8. 6. Romos-Caro FA, Mack Sexton F, Browder JF, Flowers FP: Acantholytic acanthoma in an immunosuppressed patient. J Am Acad Dermatol 1992; 27: 452-3.